Yesterday's storm brought over an inch of rain to most of Southern New England along with wind gusts in excess of 50 mph. There was also snow in the highest elevations of Massachusetts and New Hampshire. Here is a list of storm reports from the NWS. Due to an upstream block in the atmosphere the system is taking its time to exit the Northeast but its not strong. It doesn't look impressive, but that max off the Cape is worth watching. 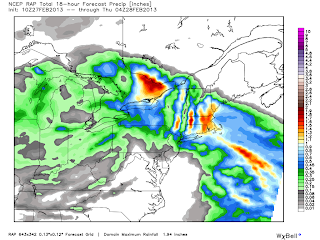 Finally there is a rumor about a storm next week. I'm not on board for a storm but its going to be close. Have a good day. From what my eyes can see it has not snowed even a trace overnight in Northbridge and we have plain rain. That ok with me, you do not have to shovel rain. Other areas well north and west will be doing the backbreaking work. This makes it clear why its wet and not white. Thursday will be unsettled with mainly overcast skies with scattered showers. Temperatures will be in the mid 40's. Overnight Thursday into Friday is interesting. Just like Sunday an upper level feature will slowly move east towards New England. Where will this set up? 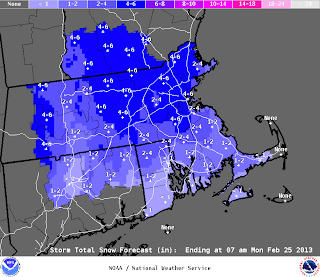 It looks like SE MA may be the sweet spot where several inches may accumulate. After this clears Friday the weekend through Monday looks good. The storm I saw for this weekend has backed off because the pattern is not breaking as the model anticipated- the cold air will eject all the way to the Gulf Coast. 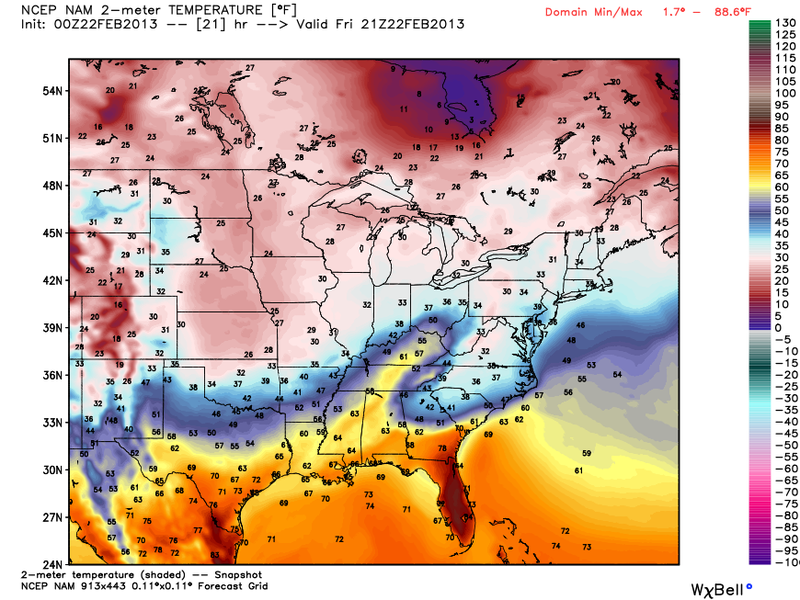 When cold Arctic air moves over the warm moist Gulf in March big things happen. Next chance for a storm is about 6-7 days. Plenty of time to watch. Snow will fall tomorrow night into the morning before changing over to plain rain. A surge of warm marine air will work into New England overwhelming the cold at mid levels. 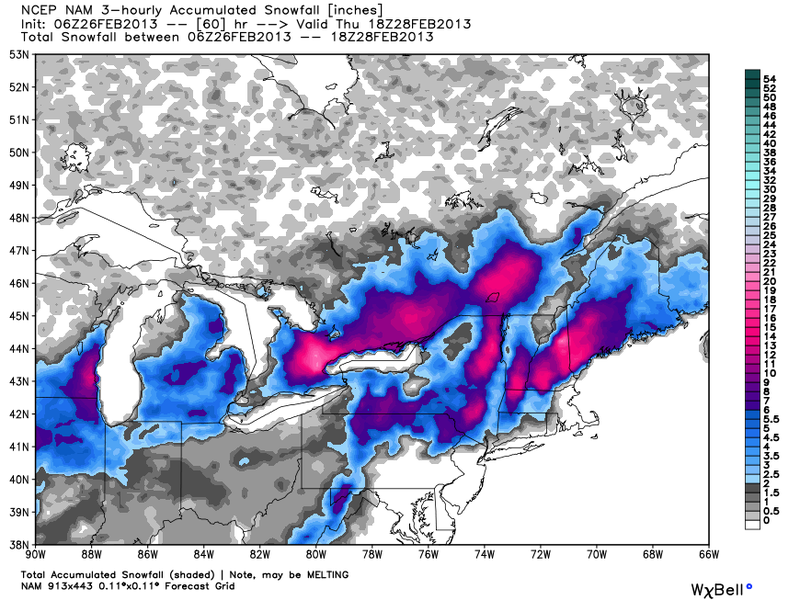 The Berkshires, extreme Northern Worcester County, and NH, VT, and ME will do well with this storm. 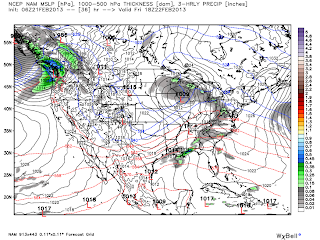 Finally there is some hint that another low pressure system tries to form Thursday Afternoon/night. It may be like Sunday afternoon or something heavier in SNE. I'm still watching that. Average confidence in the forecast overall. Enjoy today, highs in upper 30's/low 40's with a mix of sun and clouds. A surface low pressure in Oklahoma is producing the major snow from the Texas Panhandle through NW Oklahoma, Kansas, Missouri, and Illinois. As the storm occludes to the Northeast a new low pressure center will gradually develop and grab Gulf Moisture and head along the Mid Atlantic coast and eventually New England. This will make drains clog with runoff from the rain and leftover snow from the morning. Everything will be a pure winter slop. 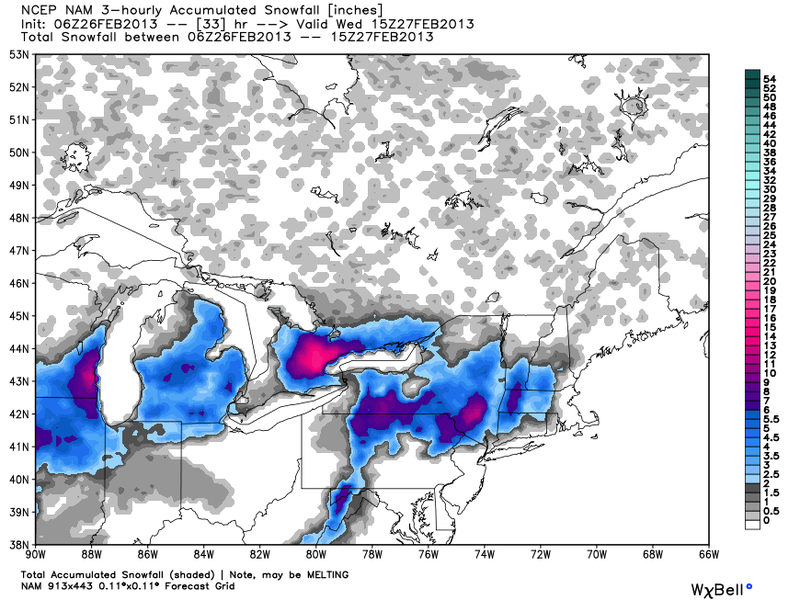 Even the snow should be heavy as temperatures will be marginal for snowfall on Wednesday. I will update in the morning. Looking back on this storm I made several mistakes. First of all I am jumping on the long range a bit too quickly. To be fair there was considerable agreement 3-4 days out, then it backed away as it became apparent the main storm would be weaker. 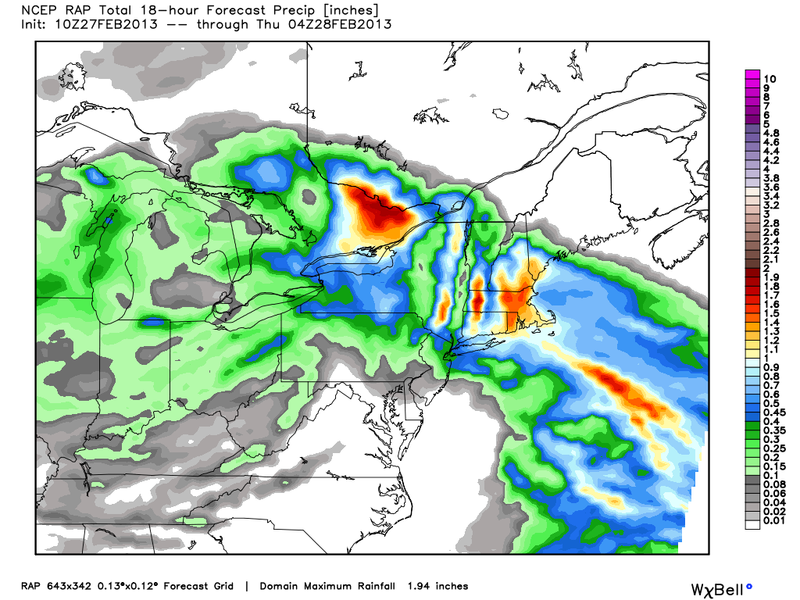 I also knew Central New England was going to get pounded but compromised with 6-10. Many locations are already exceeding that with additional snow to come. Notice the primary low south of the Cape. That system was largely responsible for the snow/rain yesterday. Today we seeing an interaction between an Upper level system with a weak surface low (remnants of the Plains snowstorm earlier in the week) and the coastal storm. So all in all we didn't get the coastal storm that was originally anticipated, but we will end up with a small-moderate event. Storm clears overnight and Monday will be nice. High pressure takes control and most of the region is in the mid to upper 30's. CT looks to approach 40. Another nice day under the influence of high pressure. Similar to Monday in all regards. Ah yes. Here is what I am seeing- a strong winter storm will impact the Southern Plains beginning today (Sunday). 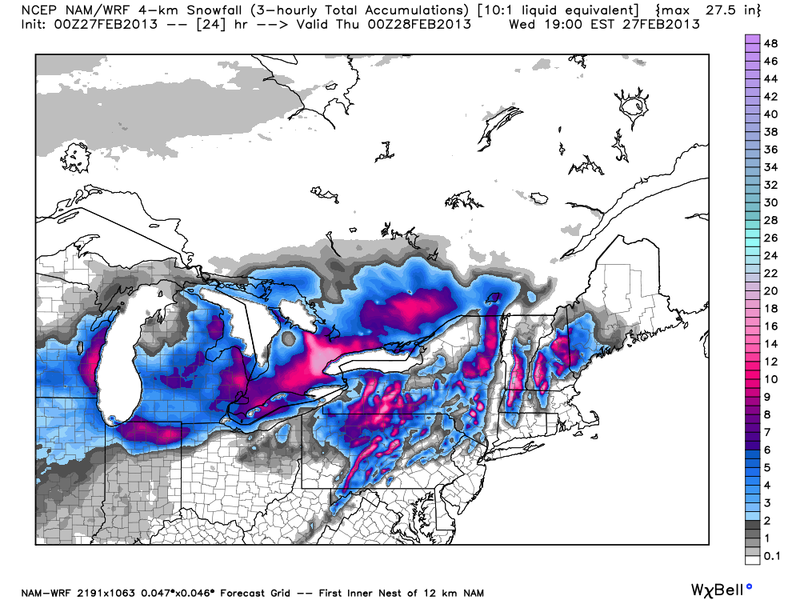 It will track to the NE towards the Great Lakes. It will run into a block, slow its momentum and develop a new low pressure center off the Mid Atlantic coast by Wednesday morning. 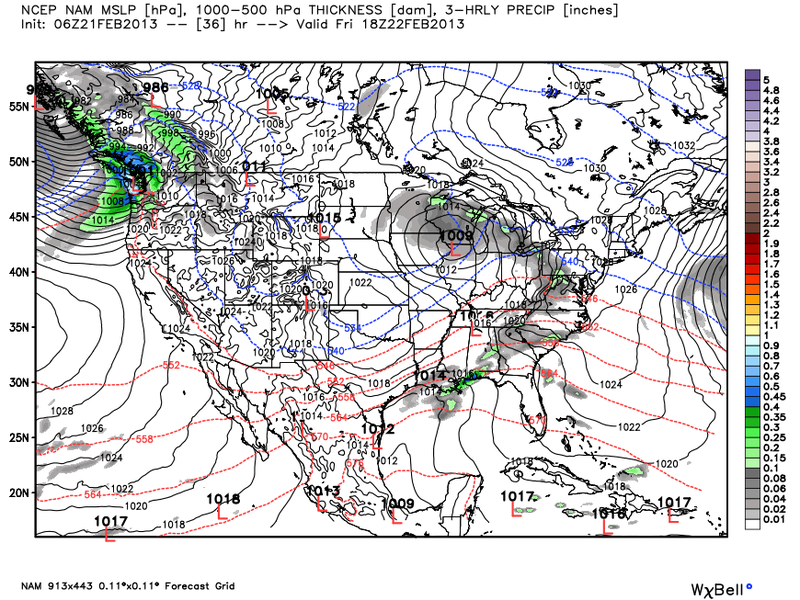 A powerful high pressure area will begin to develop in Canada- looking at possibly a 1050 high! This is very complex; in fact I don't have many details for you as of this morning. The models will struggle and so will forecasters. 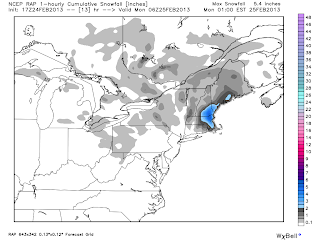 My take is that the EURO will have the best forecast so I will likely lean heavily on that model and its output. So that puts snow down Wednesday Morning before a switch to rain, then back to snow. My best advice is look out for snow/rain/wind for the second half of the week. Plenty of time to fine tune the details but my sense is something big is lurking. I won't post until tomorrow afternoon as I have a post to do for Tornado Titans. Look for the weekly snowfall outlook on that site! 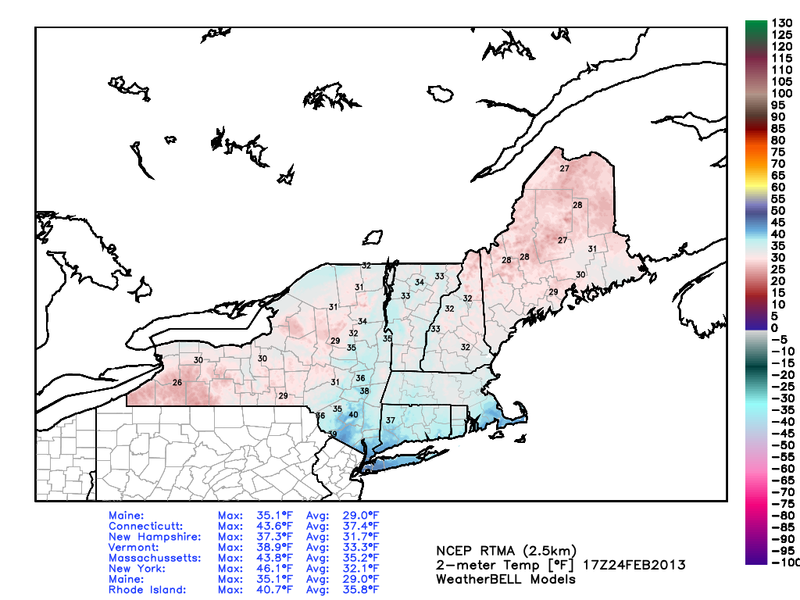 The storm that looked so promising (for snow lovers) early in the week has largely trended warmer and weaker. I'm not a fan of changing a forecast because A) it means I was wrong and B) no one likes a flip flopper. None the less when there is no support left for a 48 hour forecast I must blow it up and start over. The precipitation will not begin until later this afternoon. The majority of the snowfall will be Sunday. It will not be from the storm but rather an interaction between low pressure in the Great Lakes and the departing storm. The Southern Maine/NH seacoast/Northeastern MA may actually do quite well Sunday/Sunday night. 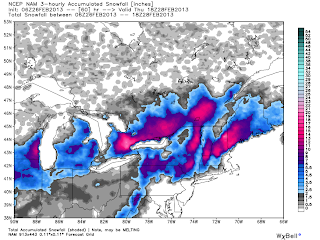 York, ME and surrounding area's may get over a foot! Finally stay tuned! There is more active weather expected next week. I will update this weekends storm as needed and will post on next week tomorrow morning. A winter storm watch was issued by the National Weather Service in Taunton for Hampden, Hampshire, Franklin, Worcester, Middlesex, and Essex county from Saturday Afternoon-Sunday Afternoon. All systems are go for a moderate to major storm. 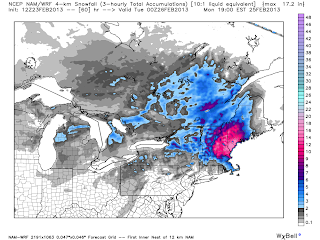 Again we will not see the Blizzard of 2013 again but this time around Southern New England is in for heavy wet snow which will take down trees and power lines. First lets talk about today's weather. High pressure still in control in Ontario, a major snowstorm is cutting towards the Great Lakes and also occluding, and a front/low pressure loaded with precipitation is working through the Southeast. The transfer from the upper level low to the coast will begin tomorrow morning but before that we will have a calm relatively mild Friday. 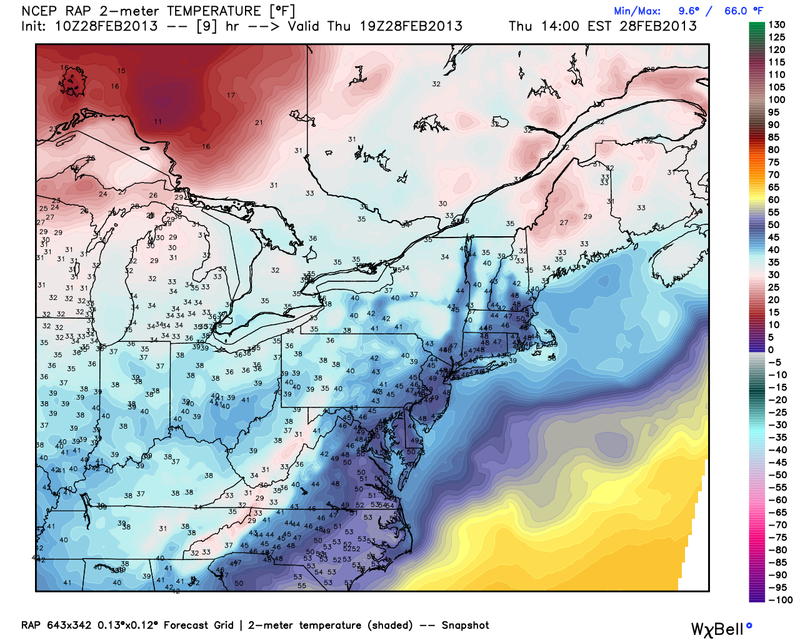 Most will rise into the upper 30's and some lucky ones will get into the low 40's. 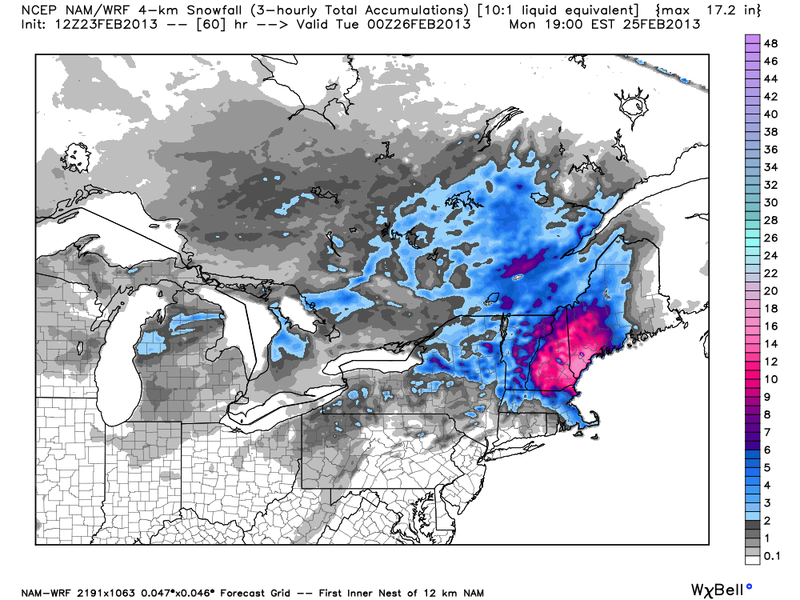 This puts most of Southeastern New England greater than 1 inch of liquid precip. My take is that some models (including EURO OP) are overwarming the surface. 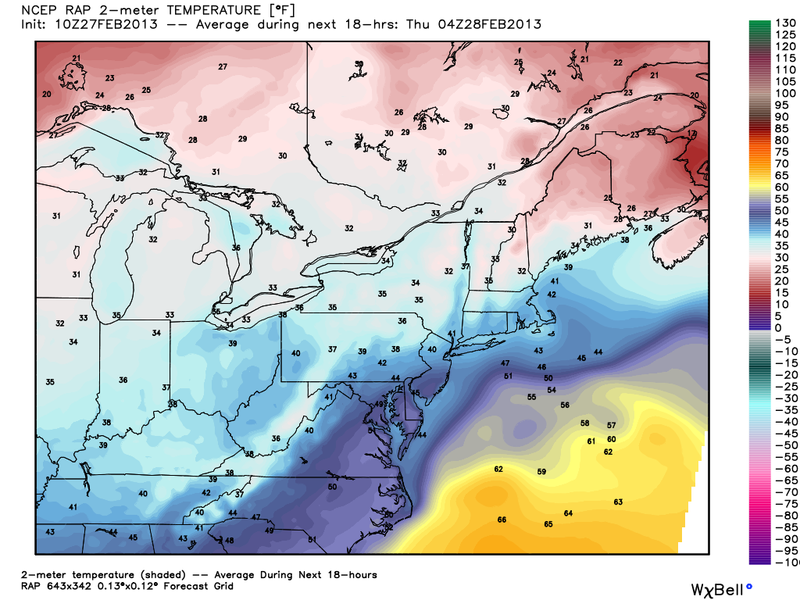 At the 850 mb level it will be cold enough to support all snow from the CT/RI/MA border on north. There is no classic high pressure to the north (like we saw in the blizzard) but these systems can create there own cold air when the precipitation is heavy. You can probably chop some of the 4-8 off Northern Maine- the 12+ is going to be tricky. I will refine tomorrow morning. 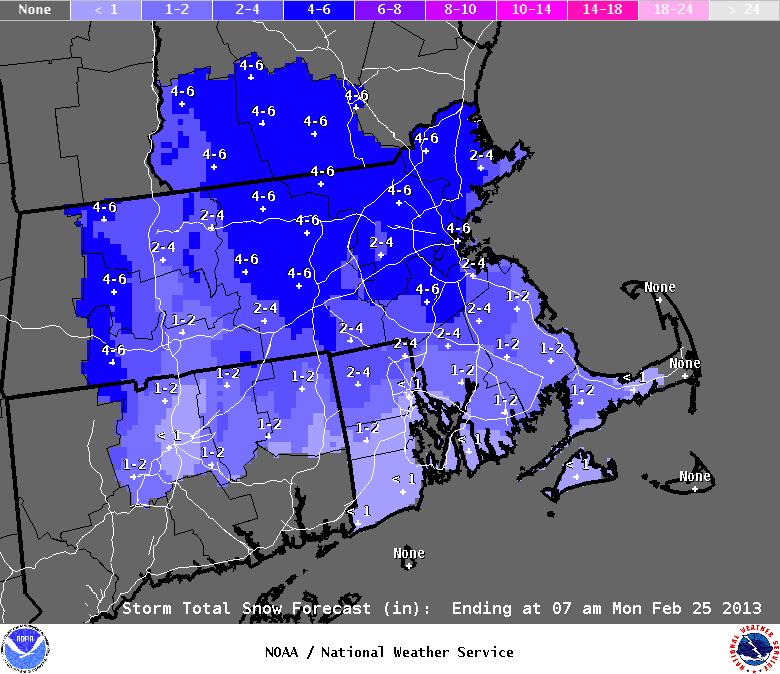 I think Boston comes in over 6 inches, but under the 9.4 needed to set the February record. Lets also keep in mind yesterday's North American Meso Model runs at 12/00z- they advertised much more snow with a stronger system. For the third straight weekend there is a Nor'easter for meteorologists and weather enthusiasts to track (early heads up-something wild next weekend is lurking to make it 4/4). For the first time this year a rain/snow line will try to work north and west. I think it will struggle to get past 495 or north of the Pike but those areas will see a brief mix with rain or sleet. Overnight lows will drop into the lower 20's/upper teens. 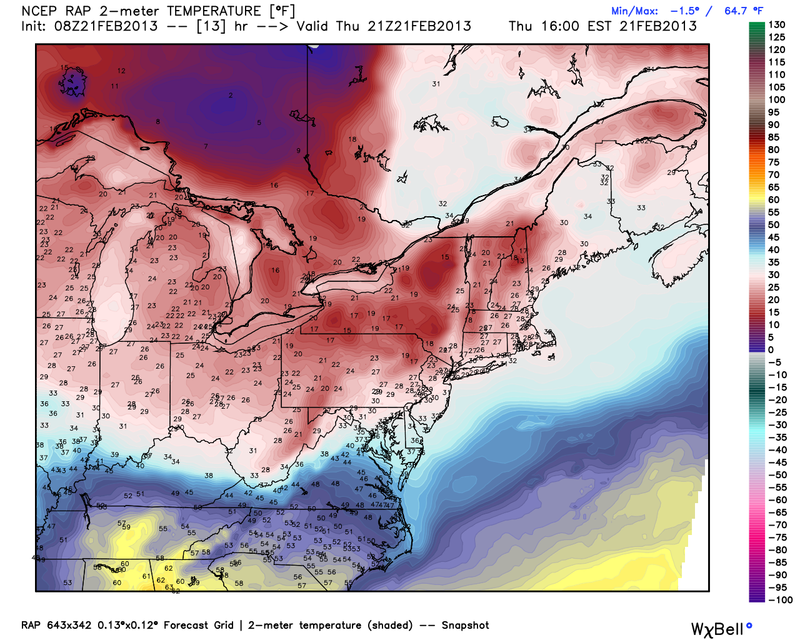 By Friday the track of the Central storm (aka "Q") will lift some warmer air into New England. So what will happen at the surface is the low will work its way into the Wisconsin/UP of Michigan and weaken. Meanwhile energy will round the base of the trough through Texas and develop a new surface low in the Southeast which will move off the east coast and head up the coast. No amounts yet, you'll have them tomorrow. That blue and pink may feature plain rain for a time as the center makes its closest pass and wraps warm air in. The Atlantic Ocean, though warmer than average, is still cold. If need be there will be an afternoon update, if not see you tomorrow morning!